The Geneva Music Festival is pleased to bring Thomas Bergeron back to the Finger Lakes as part of its two-concert celebration of jazz. On Sunday, June 11, The Thomas Bergeron Quartet will present a jazz-chamber fusion at Geneva-on-the-Lake. The Thomas Bergeron Quartet will be joined by special guest, oboist and clarinetist Paul McCandless, and a string quartet of GMF’s artists-in-residence. Bergeron is a trumpeter, composer, bandleader, producer and educator known for excelling in both the jazz and classical realms. His jazz chamber ensemble has released two critically-acclaimed albums inspired by the work of Claude Debussy and Olivier Messiaen. His third release, anticipated this spring, features music of Rachmaninoff, Scriabin, Liszt, Takemitsu, and original compositions. In addition to composing and performing with his own ensemble, Bergeron is a member of the Atlantic Brass Quintet, Principal Trumpet with the Springfield Symphony, a frequent Broadway orchestra musician, and an in-demand classical and jazz freelancer. 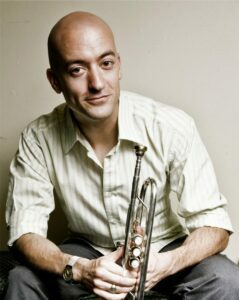 He is an alumnus of Carnegie Hall’s resident Ensemble Connect, and has performed with T-Pain, Vampire Weekend, Gabriel Kahane, The Danish National Symphony Orchestra, The American Symphony, The Temptations, Idina Menzel, Judy Collins, Jon Irabagon, Arlo Guthrie, Ernie Watts, and the Radio City Christmas Orchestra, among others. His network television appearances include Saturday Night Live, Jimmy Kimmel Live, and CBS This Morning. See his full biography online. Whether performing or arranging, his inspiration is essentially the same: “Put simply, I gravitate towards music that most directly reaches my soul. Stylistically, I love to work with music that encourages the players to interact with each other through either improvisation or expression (or both),” he says. Similarly, he doesn’t limit his personal enjoyment of music to one style or genre. His playlist contains a wide variety, including electronic dance music (EDM), hip-hop, salsa, jazz and classical. Hear for yourself how he brings these many influences together in a chamber-jazz fusion on Sunday, June 11, at 3 Geneva on the Lake. Drinks and hors d’ouerves on the terrace at 3:30 p.m., concert begins at 4 p.m. Tickets are available on the GMF website.